Life span of 15 plus years. and available in two styles, Synthetic Palm and Synthetic Reed. It can be used over ply or as the roof cover by itself – (the Synreed tiles when used alone provide minimal “waterproofing”) – Synpalm however is about 98% waterproof i.e. there will be the odd drip in continuous rain. Because it “breathes” temperatures under a thatch only roof are typically 10-15% cooler than summer ambient temperatures. 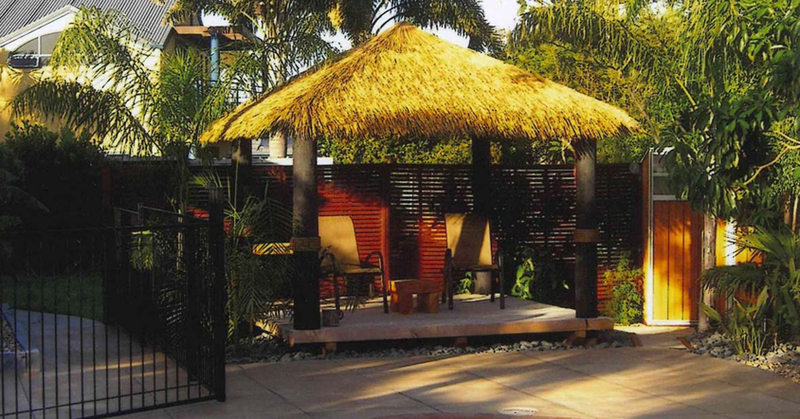 Our synthetic thatch tiles are made from polyolefin not PVC and have a flexible binding making them a very durable and versatile product. The synthetic tiles have an expected life of 15 years plus. They are made from polyolefin and have uv and colour stabilisers added, not PVC which tends to become brittle when exposed to the sun. 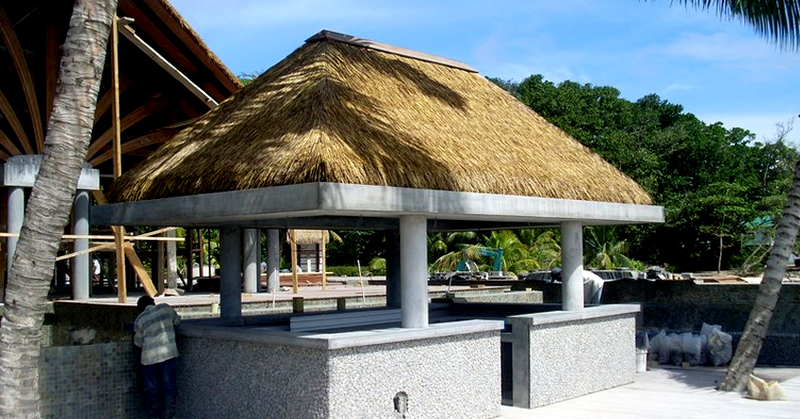 SynPalm thatch can be installed by itself as a cover providing similar “waterproofness” as the natural tiles, or over ply. When installed correctly the synPalm tiles will provide a roof that is 98% waterproof i.e. there will be the odd drip in continuous rain. It requires mid tile support when installed by itself. SynReed thatch is designed to be installed over ply. 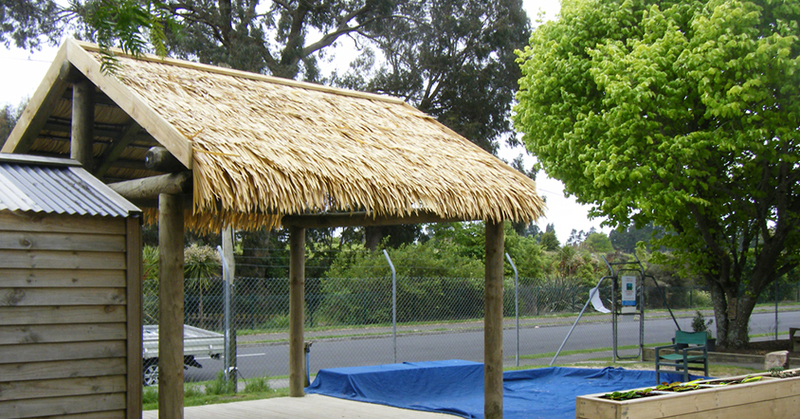 It can be installed by itself as a covering and it will “look the part”, however provides shade rather than rain cover. 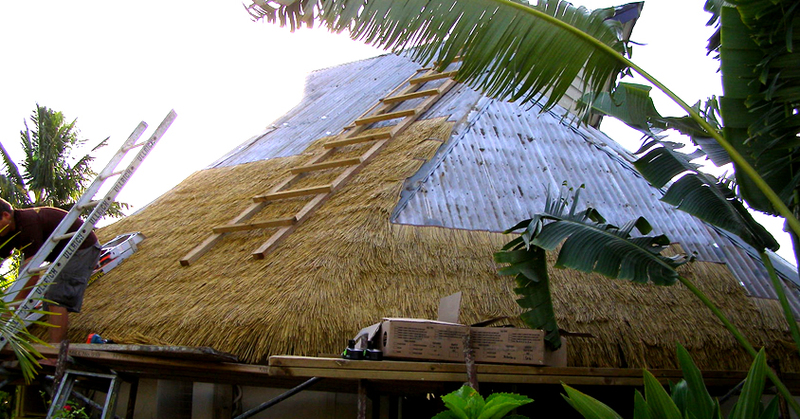 How Waterproof is the Synthetic Thatch? 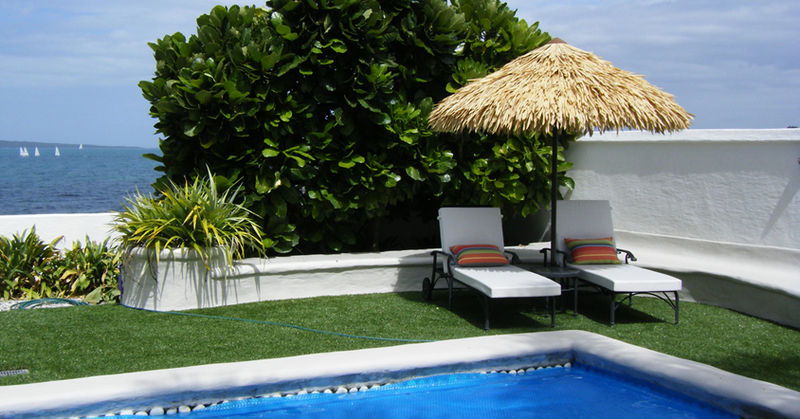 Why should you choose Brustics Synthetic Thatch? Very durable and versatile product. The synthetic tiles have an expected life of 15 years plus. 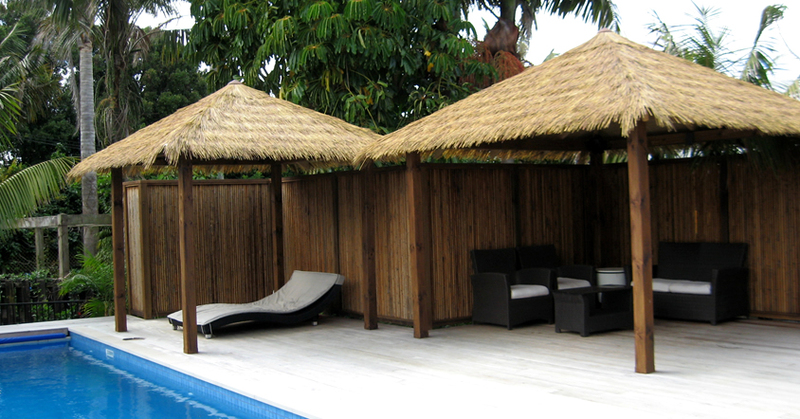 SynPalm thatch can be installed by itself as a cover providing similar “waterproofness” as the natural tiles, or over ply. When installed correctly the SynPalm tiles will provide a roof that is 98% waterproof i.e. there will be the odd drip in continuous rain. 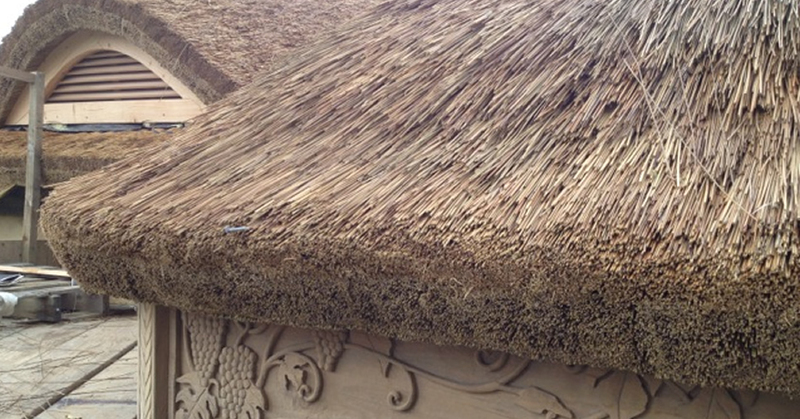 SynReed thatch is designed to be installed over ply. It CAN be installed by itself as a covering, however provides shade rather than rain cover. 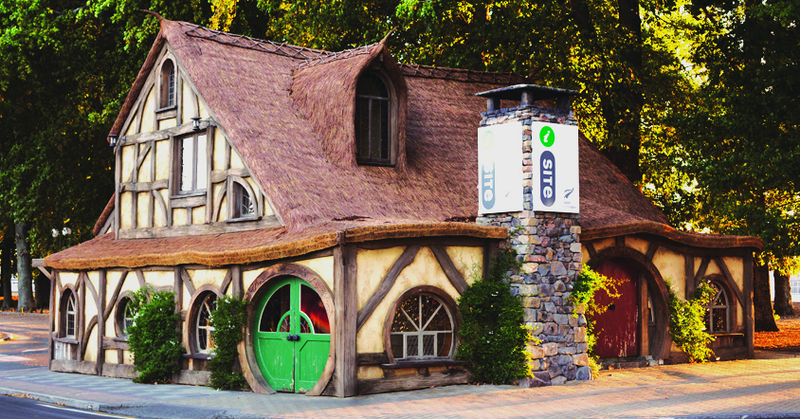 Our synthetic thatch doesn’t rot or decay. No toxic mould (prevents health hazards). Designed specifically for harsh climates. 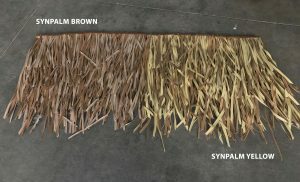 Available in two styles, Synthetic Palm (“SynPalm” flax type thatch) or Synthetic Reed (“SynReed”). They have a life of 15 years plus. 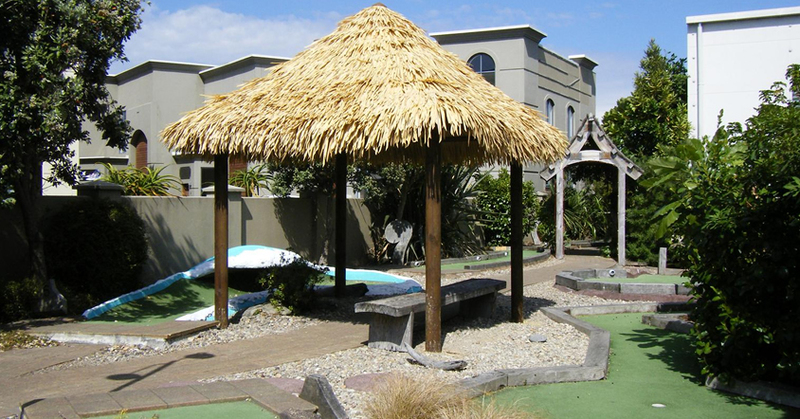 SYNREED THATCH – perfect for commercial situations these tiles provide a genuine thatch look and are normally used to cover ply. Their advantage is they require little or no maintenance and have exceptional longevity. 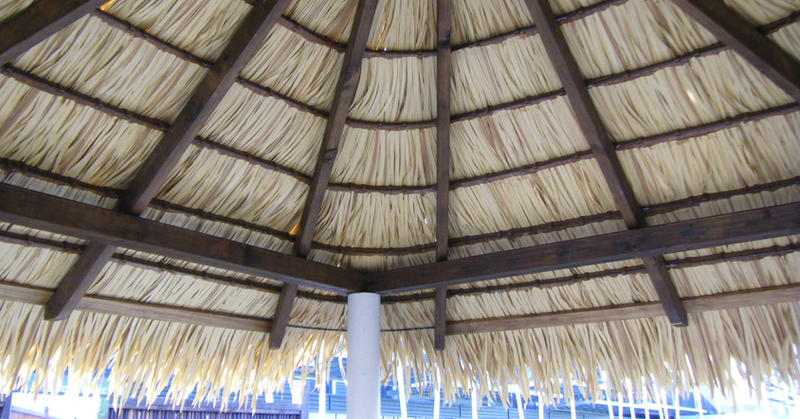 Feathered or graduated cut reeds are used to give the appearance of a flat thatch roof, which can be left jagged to provide a tropical look or combined with eave block (as per the I-site roof) to provide a thick European thatch look. 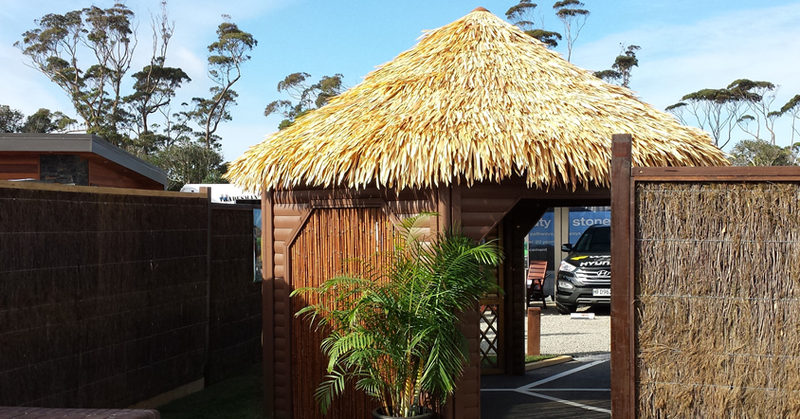 The synreed thatch is designed to be used over ply and with the combination of eave blocks will provide the look of a thick thatch roof without the need for maintenance. 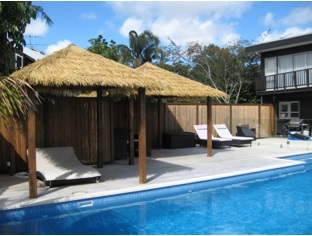 SYNPALM THATCH – The palm thatch look, synonymous with the thatch typically used in pacific island thatch roofs (fales). The palm thatch will be approx. 98% waterproof when used alone or can also be used over ply. These tiles are 98% waterproof used alone or can be used to cover ply. Their advantage is they have a great “cover” therefore are very economical. 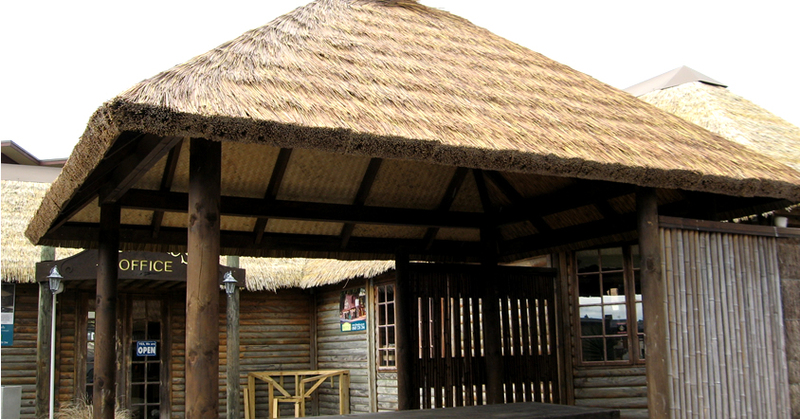 Thatch Tiles - These tiles can be clipped onto an 8mm steel rod or nailed onto wooden purlins. There are 4 different styles of tile (see below) the spacing of tiles determines the area they cover. With the Standard and SynPalm tiles, we recommend spacing between the rows of 300 - 350mm; this is reduced to 230 - 250mm for the Tropical and Synreed thatch tiles i.e. more Tropical and SynReed thatch tiles will be used to cover the same area compared with Standard or Synpalm. 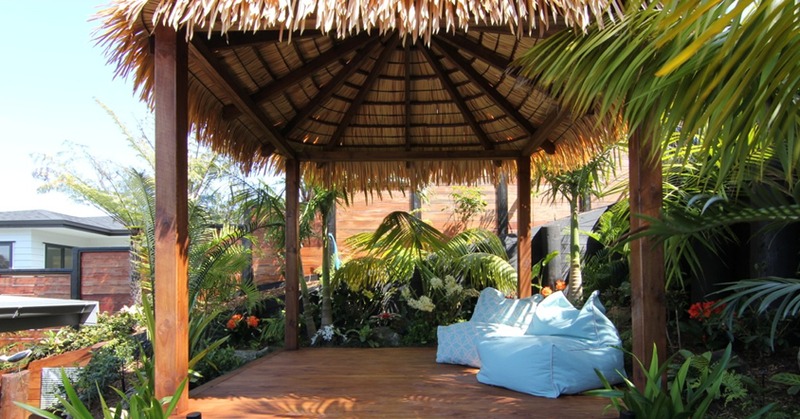 "For square edge or tropical look"
Thatch - A level of experience is required for optimum installation. Our kitsets are designed to provide the best result if DIY install is preferred. Please note; fees apply to re-design or rectify where we have not installed. 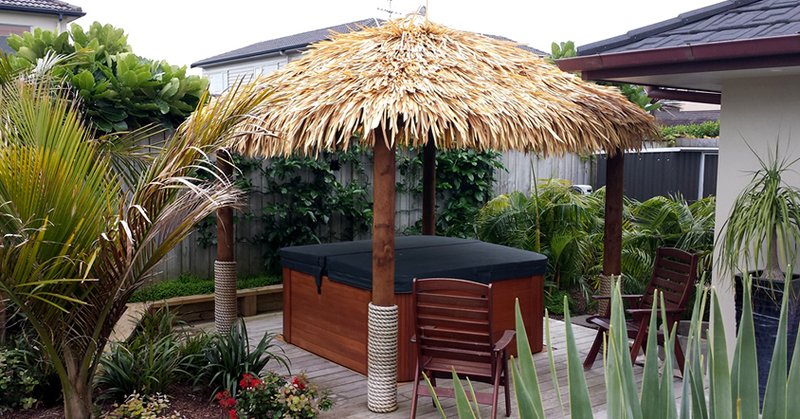 When installed correctly Standard, Tropical and SynPalm thatches will be approx 98% "waterproof" i.e. there will be the odd drip. 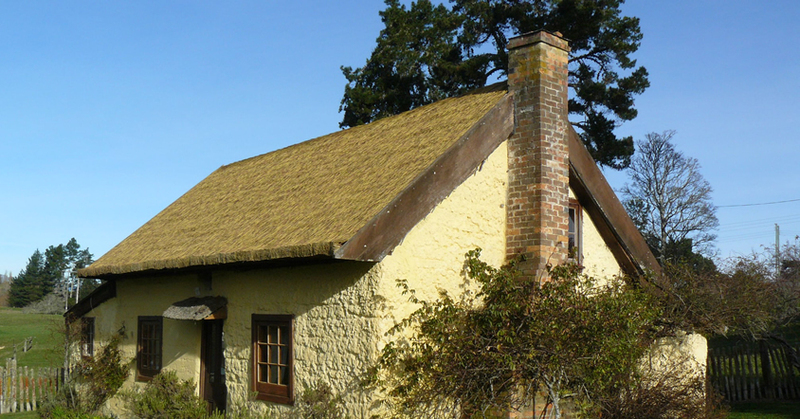 Natural thatch has an expected life of 5-7 years in New Zealand. 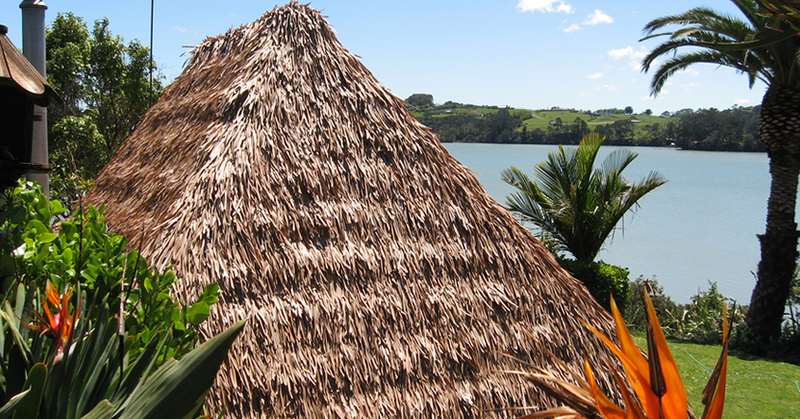 Synthetic thatch has an expected life of 15+ years in New Zealand.